This post was 1st published August, 2012. In addition to the well-known VIX index, the CBOE also publishes the VXV index. It’s computed just like VIX, except that it gauges the implied volatility of SPX options 3 months out, rather than just one month. The chart below shows the 10-year history of these two indexes. Recently I posted on how the medium term time structure of VIX futures has ramped up to record levels. It’s not obvious if this trend is associated with a similar trend in longer-term SPX options implied volatility or not. The CBOE only gives the VIX style term structure from 2010 forward; however we can get 10 years of data on the front part of the term structure by looking at VIX and VXV. The result below shows that the slope of that part of the SPX based term structure is also at historic levels. The black line shows the 200 trading day moving average. I don’t know how to tell chickens from eggs here. The 1 to 2-month term structure on VIX futures is not showing this trend, so it’s limited to the further out maturities. 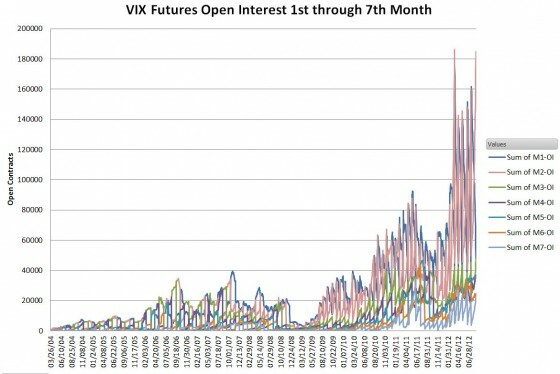 The chart below shows that open interest on VIX Futures has been growing rapidly on all maturities since 2009. The rapid up and down movement of each contract month is due to the daily contract rolls that volatility ETF/ETNs use to track their indexes. Most of the action in SPX options is in the shorter time frames, the dollars involved are high enough that the impact of short term VIX futures is probably insignificant. However it’s possible that action in the longer maturity VIX futures is driving demand back into the much quieter longer dated SPX options—steepening the curve. Investors might be forecasting a correction in that timeframe. Given that the VIX has proved to be a lousy predictor of market action even one day in advance I find that hard to believe. The market’s expectation of correlation between the individual stocks and the market itself might be changing. The CBOE publishes an implied correlation index that shows the 2014 options trading at levels unprecedented for a non-panicky environment. It’s possible that traders trying to take advantage of this correlation are driving SPX option prices up. 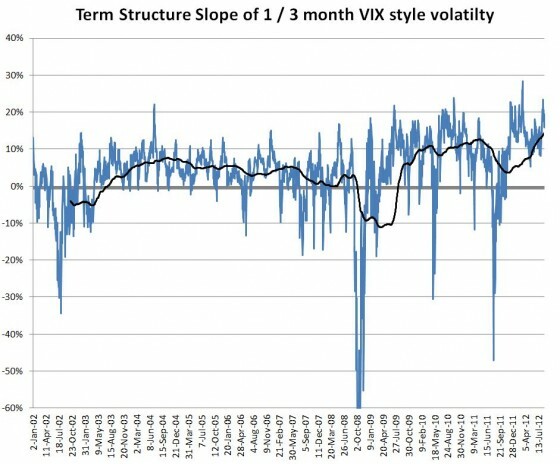 Practically this shift in the term structure might be a boon to SPX option calendar plays, and might be a problem for Barclay’s XVZ because it uses the VIX/VXV ratio as a trigger for shifting allocations. 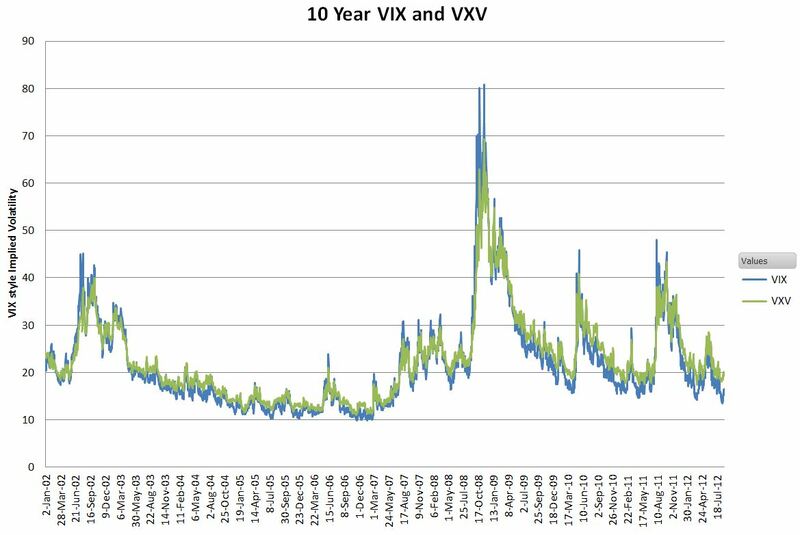 This shift could bias the XVZ towards a more bullish posture, but since the allocation shifts don’t start until the VIX/VXV ratio gets above 0.90 it might not have any effects if the behavior during panicky times stays consistent with historical norms. 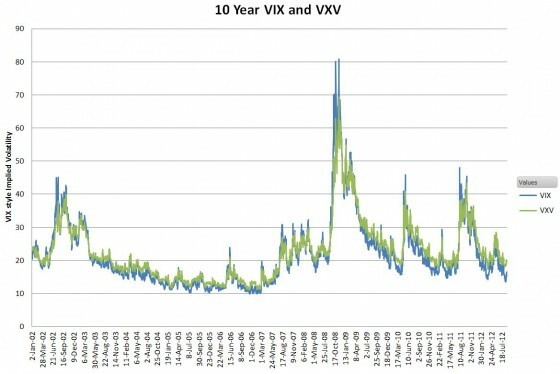 As recently as the 2011 correction the VIX/VXV indicator worked very well for XVZ. I’m certainly not convinced that medium-term VIX futures are driving this SPX option trend, but even if they are I don’t agree that this is an ominous distortion of the market. If lots of people decide they want to buy longer term corn futures contracts the price will likely go up. Is that a distortion of the corn market?